I “met” author Clare Davidson at WANATribe in 2012. At that time, I read her first book Trinity and gave her my honest feedback. 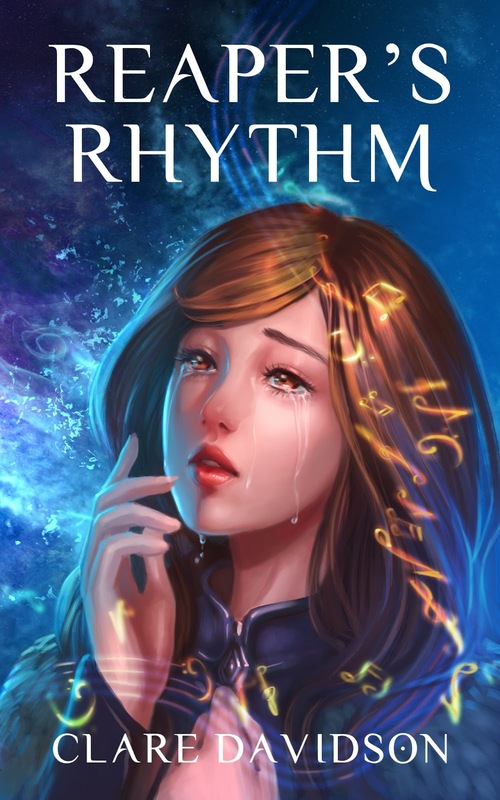 I picked up her second book, Reaper’s Rhythm, at the recommendation of another young adult author. It sat on my Kindle for several months before I finally read it. Not because I wasn’t interested in it but because I have quite a collection of books to be read and reading those in the young adult fantasy genre always take precedence. This story begins with the death of the main character’s sister. The remainder of the story involves her quest to prove it was not a suicide. The main character, Kim, was well-crafted. Her emotions and motives seemed clear. Sure, she makes some poor choices but she’s only 16 and she’s suffered a massive loss. I had a hard time connecting with her but I think that was mostly because her interaction with her real friends was limited. I felt like I only saw her as the freaked out victim and wondered what she was like beforehand. In essence, I see the need for giving us “normal world” before plunging us into the deep mystery. Most of the other characters weren’t fully developed but it didn’t affect the story. There is a clear problem and growing conflict to keep the story moving along. I was most disappointed in the rendering of Matthew. He obviously had strong feelings and motives but he was allowed to be a cold, aloof bystander in the heroine’s life. Most of my objections to this story have nothing to do with craft or the story itself. They are based on personal preference. If you love paranormal stories, you will enjoy this book. If you’re looking for romance, look elsewhere. Everything in this book is one-sided and shallow as far as the romance is concerned. If you like mysteries, you might find this a good read. I felt it lacked the proper dispersal of clues and leads to be considered an effective mystery. Even though strange occurrences in this book are referred to as “magic,” I didn’t find that an accurate assessment. It seemed like a clear demon versus angel setup. The demonic element was woven through music which I found rather cliché (of course, I did grow up during the “back-masking” scare era). In any case, the “magic” system didn’t have adequate explanation so I didn’t buy into it. There were contradictions about see-ability for the two “magical” races. The backstory for the creation of the Shimara seemed shallow and contrived. I read the book in a short time and the plot compelled me forward, but the world created by the author was unconvincing. Will I read the sequel? Maybe, but it isn’t high on my priority list. If you’re looking for an emotional, fast-paced read, pick up this book. I don’t believe you’ll be disappointed. If you want to be blown away by unique fantasy elements, you won’t find that here. While there is a mystery, the story doesn’t progress as a mystery should. If you think one-sided attraction constitutes romance, you will find the story romantic. In the end, this story will appeal mostly to paranormal fans with an understanding of British customs and language. While I wasn’t distracted by those things, I believe my obvious relation to American teenagers kept me from relating fully to the British characters. On Goodreads, I gave this book four stars. After all, I finished it in a day and it held my interest. If you’ve read this book, I’d love to hear your thoughts. Please comment.